Now, un Ubuntu 11.04 im put this options and Working only the TV, the radio (gnomeradio and kradio) no work, no detect the radio, but this options create the file /dev/radio0. Same problem. Have Pinnacle Systems PCTV 50i PCI card (saa7134 based) that worked on all Ubuntu versions from Hardy through Maverick. Tried to install different frontend CLI and GUI apps (gnomeradio, kradio, ncurses-radio etc to no avail). It looks like the audio part of saa7134 driver works fine (through loud static noise i can hear badly tuned FM stations on some "default" frequency), it is frequency tuning problem (VIDIOCGAUDIO, VIDIOCSFREQ errors are visible in all apps when running from terminal). The issue was solved by downgrading linux kernel from 2.6.38-8 to 2.6.35-22 (had to temporarily change "natty main" to "maverick main" in /etc/apt/sources.list to do that). Same problems like nihilus have. Did't tried with older kernel. Currently i'm successfully using SMplayer as a frontend to it. - where 101.50 is your FM frequency in MHz. > The old VIDIOC_*_OLD symbols and V4L1 support were removed. So we have a bunch of apps that was not actually ported to V4L2 or simply doesn't work without V4L1. This bug is solved in the Kernel Linux version 3.2.0-24. I can not confirm that this bug is fixed. 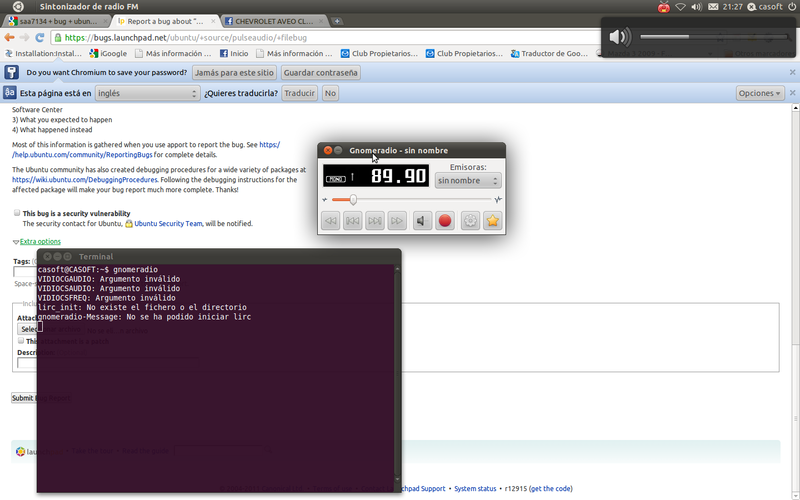 In 12.04 with recent kernel 3.2.0-30-generic-pae FM Radio is not working with gnomeradio. I can only hear an annoying noise. When booting Lucid kernel 2.6.32-42-generic (in 12.04) gnomeradio works out of the box. In 12.10 all works fine. I tried in 12.10, booted from iso file quantal-desktop-i386.iso. I couldn't get the GUI working so I booted into text mode and used fmtools. I hear my favourite radio station. #29~precise), my radio is working again. so to solve the problem in kernel 3.2.x?